Oil giant BP announced Tuesday that its annual profits had jumped by 39 percent to $25.6 billion, as last year's soaring oil prices fueled results. The dramatic fall in oil prices last year -- after they reached a record high -- hit BP's profits. The news came despite a profits blow in the final three months of 2008, as oil prices retreated sharply from a record high of almost $147 a barrel in July. BP's replacement cost profit -- which strips out unrealized gains or losses related to changes in the value of inventories -- for this period was almost $2.87 billion, compared with $3.395 billion the year before, a decrease of 24 percent. Total investment for the year totaled $30.7 billion, including acquisitions and asset exchanges. In a statement on the BP Web site, chief executive Tony Hayward said the depressed fourth quarter result mainly reflected the recent dramatic fall in the world price of crude oil. There was also a net adverse effect of $900 million from items not expected to recur in future quarters. These items included a loss of $700 million by its Russian partner TNK-BP. 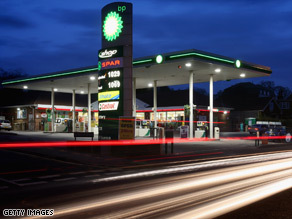 However, Hayward described BP's underlying financial and operational performance as "continuing to show powerful recovery." He said: "We have established very strong momentum in 2008 in our drive to strip out overhead costs and to make BP simpler and more efficient. There will be no let-up in that momentum which gives me great confidence that we are well positioned for the challenge of the next few years." Last week rival Royal Dutch Shell announced that its net profits had also fallen by 27 percent in the last quarter of 2008.